I decided I needed to start exercising again, and spinning--cycling on a stationary bike--is the best choice for me. Peloton looked awesome, but too expensive. I figured out a way to enjoy the features of Peloton I care about, without spending the big bucks. Here's how you can do it, too. From mid-2014 til early 2017, my pain management practice involved doing almost nothing that could aggravate my lower back. Most of my physical hobbies were reduced or eliminated. Anything higher impact than walking my dogs was pretty much verboten. While my back didn't hurt very often, slowly other parts else started to ache. Ankles and knees were taking less and less strain, my endurance was not what I'm used to, and a lack of flexibility entered the realm of hilarity. I realized it was time I started putting in some effort. Cycling has always been my favorite cardio exercise. I was first introduced to spinning while I was training for a marathon in my early thirties. I'd run three times a week, and spin four. I hated the running but loved that stationary bike. I nearly killed myself the first few classes, before I realized that strict and literal following of the instructor's cadence and resistance settings would kill me. Once I had figured out that every ride was always my own, I was in love. I was willing to wake up at ungodly hours to log in to a health club website and sign up for limited seats in a group cycling class. I would get there early trying to get a known good bike and spend a few minutes adjusting it to fit me. I bought shoes to "clip in" and shorts to wear over shorts that padded my nethers from a hard, hard seat. I pretty rapidly got into the best shape of my life. Things have certainly changed, for me, since my early 30s. I no longer live someplace where group classes are feasible. I no longer live in a fantasy where group anything is entertaining. I knew I wouldn't wake up early to sign up for classes. Then, I heard about this kickstarted, networked group cycling bike called Peloton. I was instantly intrigued. Peloton is designed to bring all the fun of a high-intensity spin class into your home. 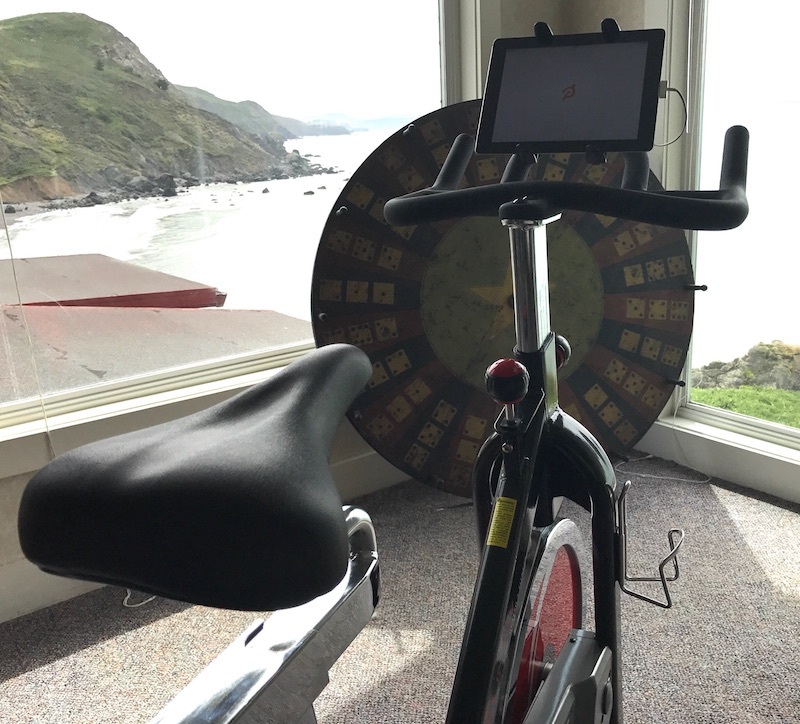 A dedicated bike, set up just for you, with a big HD screen to stream the instructor, and the rest of the class, right into your workout space. Readouts give you fancy information like cadence, resistance, and output. No scheduling is necessary, with live classes starting every hour and a huge library of on-demand workshops always on hand. The bike is made with the latest and greatest technology and designed to include all the bells and whistles. Were it not for the $2,000 price tag, I'd have just bought it on the spot. I had no doubt this was for me. Peloton also proudly advertises their "app." Designed for IOS, You can run Peloton on any iPhone or iPad, and it gives you the most important part of the service: the classes. For $13 a month the app allows you to schedule into, and stream, any live or on-demand class in the Peloton library. You do lose a few features, but I was able to recreate the ones I cared about without adding back in the few I'm glad to lose. I started by looking for a great, cheap bike. Research told me that I wanted the quiet, near zero maintenance of a belt drive bike. I also learned that the heavier the flywheel, the smoother and more road like the ride. I also wanted to find one that was adjustable enough to fit me, and solidly built to take the punishment. I found the Sunny Health SF-B1002, with a 49lb flywheel. This $350 bike has ridiculously high ratings on Amazon. I am super impressed with this $350 bike! It is well built, and stable regardless how hard I ride standing or seated. There is plenty of room to adjust the bike to fit me just how I like, while not being swamped with options to fiddle with. The resistance knob takes a bit of getting used to, and you don't get the precise numbers Peloton instructors ask for, but it is perfectly useable and exactly what I remember from spin class at an expensive gym. The seat is the most uncomfortable I've ever had on a bicycle, but I've learned to cope with it. A seat cover, or flat out replacement, may be in my future. Sunny makes a bunch of models. The weight of the flywheel and number of overwhelmingly positive reviews attracted me to this one. There is a 55 lb flywheel with a chain drive if you are adventurous. By comparison, I believe the Peloton bike has a 30 lb flywheel on a belt drive. After setting the bike up at home, and spending a bit of time dialing it into my physical geometry, I needed a few extras to give me the parts of the Peloton experience I wanted. I swapped out the toe-clip style pedals (now known to younger folks at 'cages') and put on $25 binding style pedals, now called clips. I went with Shimano mountain bike SPDs that fit my old shoes. Additionally, I wanted a cadence meter, so I knew roughly how many times per minute I was pedaling. Wahoo Fitness makes a great $40 blue-tooth sensor. I also bought an iPad mount for the handlebars, to go with an aged iPad 2 that was laying about, and a water bottle. With Wahoo's cadence meter in place, I put on my Fitbit Charge HR to monitor heart rate, and loaded up the Peloton app. I was thrilled to see they offered a free two-week trial before requiring I subscribe. I can ride along with any class, and the selection is great. There are instructors who make the ride fun, instructors that make the ride painful, and instructors who can encourage me into effort I didn't think I had. The features I miss out on are seeing a leaderboard wherein one may compete with classmates on video chat. I'm an introvert and I don't want a sweaty Google Hangout. Similarly, knowing that THX1138 in Scranton, PA put in a little less effort than I did does nothing to improve my physical fitness or mental health. I am always a bit amazed, and pleased, just for having been there. Peloton's instructors largely direct the class via cadence and resistance. With my iPhone displaying cadence, and my legs telling me how much resistance I've got on the wheel, I'm able to follow their cues and get a great workout. I really enjoy having the wide variety of class types, instructors, and fresh content. Every day Peloton offers a number of live classes, or I can pick the perfect workout for my mood from their library. Wahoo also makes a speed sensor, but I didn't feel like kludging something meant for a road bike onto a flywheel. I am sure it can be done and you could have that metric as well, I just didn't need it and wanted to save the cash. I export data from Fitbit and Wahoo to Strava. Strava is supposed to integrate it and do some other magic, but I've yet to really figure that out. About a month into using this setup, and I'm pretty thrilled. I do a 45-minute ride most every day, as it is very easy. Cycling on a stationary bike is extremely low impact and a lot of fun. If this keeps up, and I'm feeling how I hope in a month or two, next up is a home reformer for Pilates.